Connect DVD Player and Cable TV box to TV. What connections will I find on a DVD Player and a Stereo TV? An analog interface that uses a RCA style plug connection for 1 video (Yellow) connectors and jacks. It is also called Baseband. Composite only supports displaying video in 480i. High-Definition is not supported. A Composite connection will provide better video quality than an RF connection. The yellow composite video connection is used for VCR and standard TV hookups as well as other video connections such as a camcorder to a TV. Typically you will use 2 Audio (Red and White) connectors and jacks to provide the analog sound as the yellow connection is only video. An analog interface that uses a 4-pin connection for video only. It is also called Y/C. An audio connection can be completed by using the Composite (Red and White) audio connections. S-Video only supports displaying video in 480i. An S-Video connection will provide better video quality than an RF connection. An analog interface that uses a 3 wire connection for 3 components of the video (Red, Green, Blue). It is also called YPbPr. Component supports displaying video in 480i, 480p, 720p and 1080i. High-Definition is supported. An audio connection can be completed by using the Composite audio connections or SPDIF connections. A digital interface that uses a multi-pin connection for video and audio. HDMI supports video in 480i, 480p, 720p and 1080i / 1080p. High-Definition is supported. The HDTV must support HDCP, otherwise the screen will be blank, without audio. Video between DVI-D and HDMI ports is compatible with a physical adapter, but audio would need to be connected separately. Generally HDMI is replacing DVI as a video interface. A digital audio connection using either a coaxial connection with RCA connectors or an optical connection using multi-mode fiber. SPDIF supports stereo and surround sound audio. 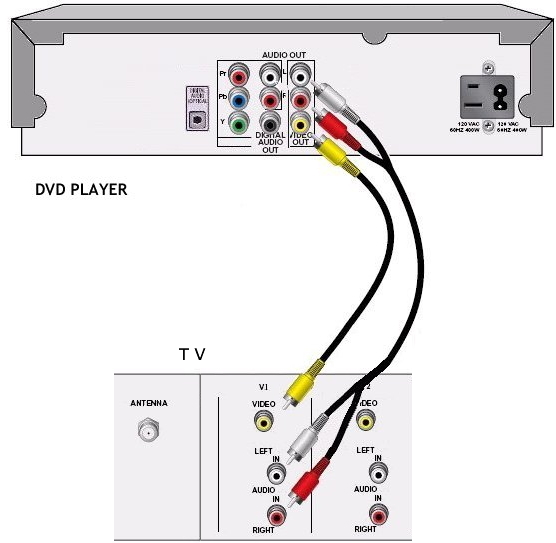 This hookup diagram shows a simple video and audio connection from a DVD Player to a stereo TV. 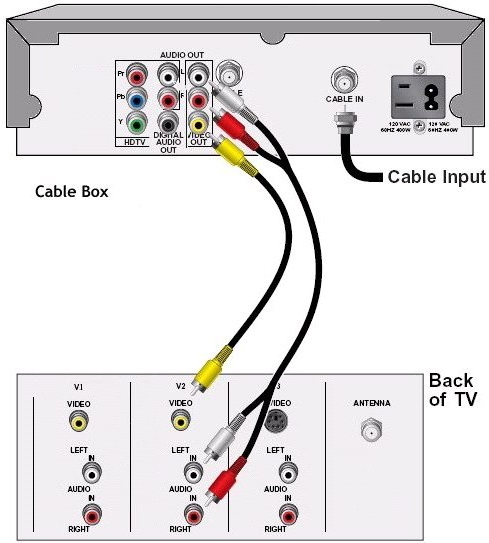 If your TV does not have RCA audio/video inputs, you have to use a RF Modulator to connect DVD player to TV. o DVD signal source IN. o TV set with A/V inputs. o One set of Audio RCA cables (1-red & 1-white audio). o One composite video (yellow) cable. Your Cable TV converter box can connect to your TV using a second set of audio/video input jacks. Select the input on the TV for the cable box when you want to watch TV programming.